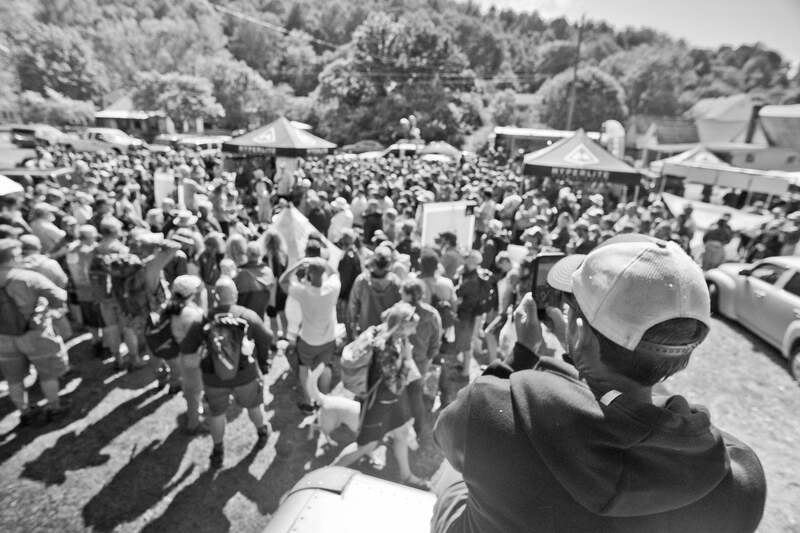 For the fifth year in a row, we attended Appalachian Trail Days down in Damascus, Va., aka “Trail Town USA.” Every year, up to 20,000 tourists make their way to this tiny town of fewer than 1,000 people around the middle of May. And every year more and more folks visit our booth. Nearly 400 people attended the Saturday raffle, along with 20 hikers who gathered round for our first “How to Set Up Your Tarp” clinic with our Chief Adventure Officer (aka CEO) Mike St. Pierre and Ambassador and professional thru hiker Ashley “Bloody Mary” Hill. Veteran thru hiker Matt “Porter” Laclair finished the trail in 2011, and has come every year since to work at the Hyperlite Mountain Gear booth. He summed up his Trail Days experience for us. Grassroots Team Member Kendra “Lays” Jackson and her partner, Hyperlite Mountain Gear Tent Maker Tyson “Tenderfoot” Perkins are two ultralight newbies on the trail, though they’ve already made it to the 890-mile mark. They returned from Waynesboro, Va., to work the booth for the festival. The event, they both agreed, offered them the opportunity to keep tabs on people they had met earlier on the AT and to experience the community from different perspectives. Check out more photos on our Facebook page or on Instagram. The post Appalachian Trail Days Roundup appeared first on Hyperlite Mountain Gear Blog.